Reading and share top 10 famous quotes and sayings about Sick Child by famous authors and people. Browse top 10 famous quotes and sayings about Sick Child by most favorite authors. 1. "The workplace would allow parents to work part time, to share jobs, to take personal leaves to give birth, tend to a sick child, or care for a well one. As Delores Hayden has envisioned in Redesigning the American Dream, it would include affordable housing closer to places of work and perhaps community-based meal and laundry services." 2. "Looking after a very sick child was the Olympics of parenting." 3. "I've spent my creative life so far first in the theatre, then on the page, then on the screen, examining what is turning out as I grow older to look like one enormous landscape. What I originally thought were different worlds turn out to be one interconnected place. And like a bedspread viewed by a sick child from his pillow, I am very aware that there are colours in various corners which I know very well, but I haven't yet found the ways to get from the blue to the green and from the green to the red. I've just begun, and I suppose that's become my preoccupation – the idea that at one point I will see it clearly." 4. 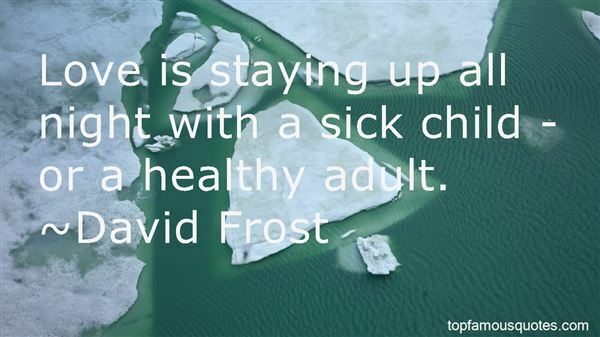 "Love is staying up all night with a sick child - or a healthy adult." 5. "The commonest error of the gifted scholar, inexperienced in teaching, is to expect pupils to know what they have been told. But telling is not teaching. The expression of facts that are in one's mind is a natural impulse when one wishes others to know these facts, just as to cuddle and pat a sick child is a natural impulse. But telling a fact to a child may not cure his ignorance of it any more than patting him will cure his scarlet fever. (p. 61)"
6. "What's been important in my understanding of myself and others is the fact that each one of us is so much more than any one thing. A sick child is much more than his or her sickness. A person with a disability is much, much more than a handicap. A pediatrician is more than a medical doctor. You're MUCH more than your job description or your age or your income or your output." 7. "What hurt him most of all, made him feel like a sick child aware of terrible wrongness and yet incapable of explaining it to anyone who might help, was that in spite of what their eyes and ears reported and sometimes their flesh, from bruises, stab wounds, racking coughs, weeping sores-these people believed their way of life was the best in the world, and were prepared to export it at the point of a gun." 8. "It is this that ruins churches, that you do not seek to hear sermons that touch the heart, but sermons that will delight your ears with their intonation and the structure of their phrases, just as if you were listening to singers and lute-players. And we preachers humor your fancies, instead of trying to crush them. We act like a father who gives a sick child a cake or an ice, or something else that is merely nice to eat--just because he asks for it; and takes no pains to give him what is good for him; and then when the doctors blame him says, 'I could not bear to hear my child cry.' . . . That is what we do when we elaborate beautiful sentences, fine combinations and harmonies, to please and not to profit, to be admired and not to instruct, to delight and not to touch you, to go away with your applause in our ears, and not to better your conduct." 9. 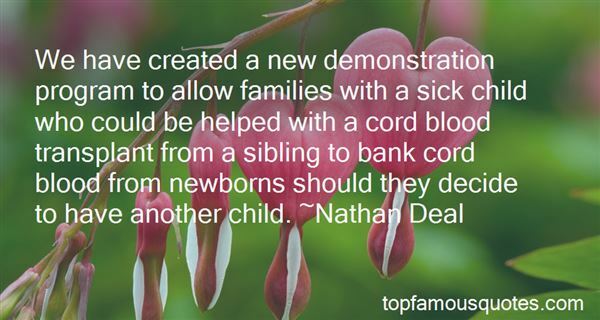 "We have created a new demonstration program to allow families with a sick child who could be helped with a cord blood transplant from a sibling to bank cord blood from newborns should they decide to have another child." 10. "Now there's a sight you don't see every day, huh? Two punked-out Goths throwing a Christmas party for sick children. (Doctor)"
Il est mon maître et je suis son esclave; il a le droit de ne rien voir."